Whatever your needs, we're here to serve you. 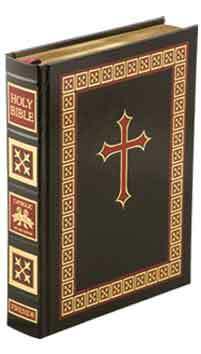 Let Fireside have each Bible personalized in your order through the use of our affordable Gold-Stamping. Especially appropriate for Weddings, Graduation, or Confirmation, our professional staff can help ensure that your Bible gifts receive that "extra special touch." For bibles with Gold page edges and embossing, Gold. For the Spanish Catholic Latinoamericana Bibles, Red and Pewter. For the Family Life Edition - White Bible, Silver. If you use both upper and lowercase letters, you can use a maximum of 44 characters and spaces per line. If you use only uppercase letters, you can use a maximum of 28 characters and spaces per line. A maximum of two (2) lines of gold-stamping is available on each Bible. Let Fireside Catholic Publishing ship your order to any address in the continental United States, at no additional cost. Visit our store to get a personalized bible.